Dyan Elliott’s fascinating study of female spirituality in the thirteenth and fourteenth centuries keeps you on the edge of your seat until the very last page. Few horror movies can rival Elliott’s book for pure bloodiness. 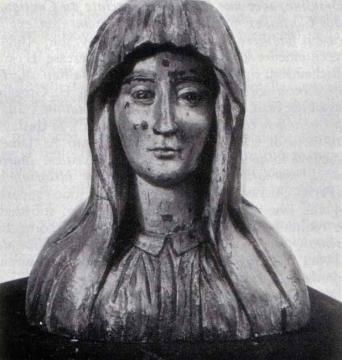 Mary of Oignies (1177-1213), pictured, received a vision of a seraph after hacking off part of her body in penance for sins she had committed long ago. Other Begiunes threw themselves into rivers or sewers to keep their chastity intact, though (miraculously) none ever drowned. Elisabeth of Hungary (1207-1231) was repeatedly beaten by her confessor and his servant while he recited Psalm 50 to her – “now I arraign you and set my accusations before you.” She died at only 24 years old because of the extreme sufferings that she inflicted on herself. For anyone tempted by the extremes of asceticism, these women’s stories serve as an important reminder of how dangerous religious abuse can be. Elliott dwells at length on the hagiographical traditions surrounding the Beguines and Elizabeth of Hungary, unpacking the medieval belief that self-mortification broke down the barriers between this world and the next. Through their suffering, even to martyrdom, these women gained direct access to God, becoming living relics. All of these women obeyed their spiritual fathers and confessors to the letter, however, and these men guided their devotion to make them into marketable saints. She examines how these men framed their hagiographies in ways that protected the women from heresy charges while making them more appealing to the popular imagination. This is not to say that the women themselves played no part in their fates. Elizabeth of Hungary, pictured, actively sought out her confessor, Conrad, because of his commitment to asceticism and absolute poverty. She encouraged him to be strict with her and it is clear that she wanted to express her devotion to God in this way.